So iGoogle is being phased out (service stops at the 1st of November 2013) and of course with my luck I’m being quite “dependant” on it. It’s not an essential service but it’s mighty handy to keep me updated on all the things I care about and try to follow. 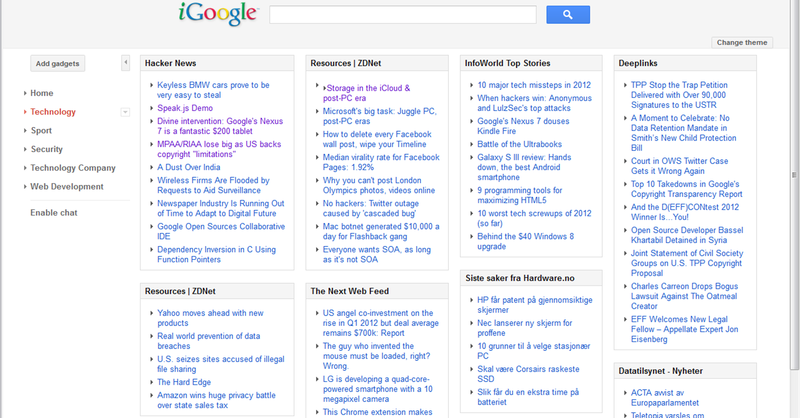 It’s not just a list of articles but the way you can organize the gadgets/feeds and have a good overview is where the strength in iGoogle lies. I can accept having to move on to a different service filling the gap after iGoogle but why did they have to screw up iGoogle before its death? 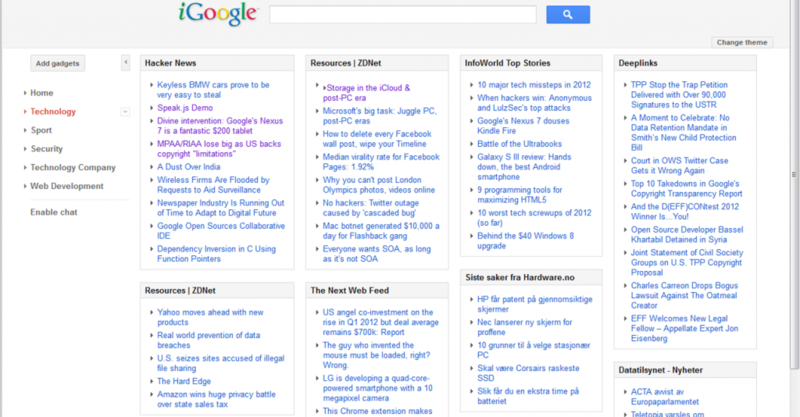 Now they’re forcing me to use the new iGoogle look which doesn’t enable you to move gadgets between tabs. This is very annoying. iGoogle also does not work on iPhone anymore for some reason; all you get is the normal Google search page. If that’s not enough, it’s impossible to contact Google about the bug/problem. They don’t have an official contact e-mail adress or contact form on their contact page and their forums/support pages are categorized by product, of which iGoogle of course is not included. So that’s Google screwing up. This entry was posted in Google, iGoogle and tagged contact, course, Death, essential service, form, Google, iGoogle, iPhone, list, look, luck, November, org, Page, problem, product, reason, SaveiGoogle, screw, search, strength, support, Update, version, way, www. Bookmark the permalink. Google is certainly screwing up with iGoogle and you’re right about their total lack of customer support, including forcing the new look. The iGoogle forum isn’t easy to find but its at https://productforums.google.com/forum/#!categories/websearch/igoogle-personal-homepage. And, the termination of support for iGoogle mobile was effective yesterday. Among other places it was announced at http://support.google.com/websearch/bin/answer.py?hl=en&answer=2664197. If you want to stay informed about iGoogle developments and alternatives, check out SaveiGoogle.org (http://saveigoogle.org). Oh shoot, I totally missed that despite having read that announcement. What are you planning to switch to Kjetil if iGoogle cannot be saved? Would love you to give Skim.Me a shot when we release.